WASHINGTON -- The Pacific coast rain forest's beauty and complexity will be commemorated on March 29 when ten new stamps are issued by the U.S. Postal Service at the Woodland Park Zoo in Seattle, Wash. at a 10:00 a.m. ceremony. The ceremony will take place at the Elk Overlook, located within the Zoo's Northern Trail Exhibit. Attendees should use the North gate at 59th St. and Evanston. A limited number of attendees will be admitted to the Zoo at no charge on a first-come basis. 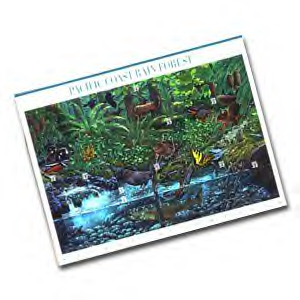 The Pacific coast rain forest stamp pane is the second in an educational series titled "Nature of America" designed to promote appreciation of North America's major plant and animal communities. The first in the series was the Sonoran Desert pane issued in 1999. Painted by John D. Dawson of Hilo, Hawaii, who worked with art director Ethel Kessler of Bethesda, Md., the stamp art includes 26 animal and plant species common to the temperate rain forest of the Pacific Northwest. Because streams, rivers and the life they support are critical parts of the ecosystem, the scene includes an aquatic component. The ecosystem supports the greatest accumulation of organic material per square mile in the world. This old-growth forest scene includes western hemlock, common raven, Roosevelt elk, vine maple, sitka spruce, harlequin duck, western sword fern, deer fern, varied thrush, Douglas squirrel, dwarf Oregongrape, winter wren, Oregon oxalis, red huckleberry, American dipper, Pacific giant salamander, western tiger swallowtail, foliose lichen, banana slug, chinook salmon parr, cutthroat trout, rough-skinned newt, tailed frog, caddisfly Iarvae, stair-step moss and snail-eating ground beetle. The rain forest of the Pacific Northwest is one of the largest remaining temperate rain forests in the world and is arguably the most magnificent. High levels of precipitation, 80 to 160 inches per year, provide the water necessary to support the giant conifers. Many of the trees may be taller than 200 feet with bases up to 7 feet wide. Trees in the forest have normal life spans ranging from 400 to 700 years. Living plant occupies almost all the available space in the rain forest.